Update 10/19/2015: you should also check out this post for new PowerShell commands that were not available at the time I wrote the post below. Scenario: you have a CI machine where you need to automate the Azure API. It only needs access to a specific set of resources, and you don’t want it to be able to do more than that. Solution: you can create a Service Principal account and give it just the set of permissions that it needs. This is a far better solution than using a Management Certificate, which has full power over a subscription. I’ll also give a disclaimer here: I work on the Azure Websites team, and not on the Identity team. I’m not an expert on that topic, but what I describe below is a technique that should work well. Many people are still using RDFE, as it’s been the only API for years. But ARM is what the cool kids are doing now, and it is worth taking the time to switch over. Besides being a nicer REST API, it supports new key concept like Resource Groups, Deployment Templates and RBAC (Role Based Access Control). The reason I’m mentioning this is that the technique described here is exclusively for ARM. I have to warn you that the steps to initially create a Service Principal are fairly complex, kind of ugly, and in some cases rather illogical. I do know that this will get easier in the future, but for now it’s a bit of necessary pain to get this going. The good news is that after those one-time steps, the workflow gets pretty reasonable, and is quite powerful. The steps below can work with both, but since most people today use a Microsoft account, that’s what I’m using in the examples. The first thing you’ll need to do is create an AAD application. 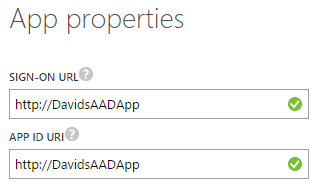 To do this, go to the Current Azure portal (https://manage.windowsazure.com/) and choose Active Directory in the left pane. Now you’ll need to give an answer that probably won’t make more sense. 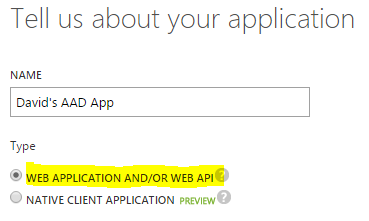 Our goal is to automate Azure from our client, yet here you have to tell it to create a Web app. Just go along with it. I warned you some steps would not be too logical! Now it’s asking you for two URLs. In our scenario, using URLs here doesn’t really make sense (it does for other scenario). But you’ll want to enter some recognizable URL, as we’ll need it later during role assignment. e.g. I use http://DavidsAADApp, which is bogus as a URL, but is recognizable to represent my app (this will get cleaner in the future). After you hit save at the bottom, it will display your key, which is basically your Service Principal account password. Save it and store it in a secure place (like a password manager). You will never see it again in the portal! The GUID in there is your tenant ID, which you’ll need later. You have a Service Principal account, but right now it’s not allowed to do anything. You’ll need to use Azure PowerShell to do this (until the Preview Portal adds support for it). Here, you’ll want to log in as your Microsoft identity in order to grant roles to your Service Principal identity (conceptually: you’re the boss, and you set permissions for your ‘employee’). Now, you can assign roles to your Service Principal. e.g. let’s give it access to one of the resource groups in our subscription. You can use either App ID Uri or Client ID as the value for the -ServicePrincipalName parameter. If you run Get-AzureRmRoleAssignment, you should see the assignment. So we’ve finally come to the point where you can make use of this! We’re going to use PowerShell again, but this time not as ourselves, but as the Service Principal identity. e.g. this is what you would do on your CI server, where you’d never want it to use your own identity. To make sure that we’re not cheating, let’s start by removing all identities that PowerShell knows about. You can list them using Get-AzureAccount, and then run Remove-AzureAccount YourLiveID@live.com to remove it. Security note: because you need to use the key explicitly in this command, you’ll want to avoid having it as is in your script (or it might end up getting pushed to a public repo by mistake!). Instead, you’d set up the CI server to make it available to you as an environment variable, and use that instead (or something along those lines). We are now able to add the Service Principal account, e.g. But if we try it on some other resource group that we were not given access to, it will fail. e.g. This is RBAC doing its magic. I know, it feels like a lot of steps to do something simple. Those steps will definitely get easier in the near future (there will be a way to create the Service Principal with one PowerShell command). But for now, with a little extra work it will let you automate your Azure Account in all kind of interesting ways, with the power of RBAC scoping access to exactly what it should be.